We’ve been talking a lot about shorts lately, haven’t we? I’ve noticed that in my sewing, I tend to make tops. I have a lot of me-made tops in my closet, but not a lot of shorts and pants. Why is that? Fear. That’s it. 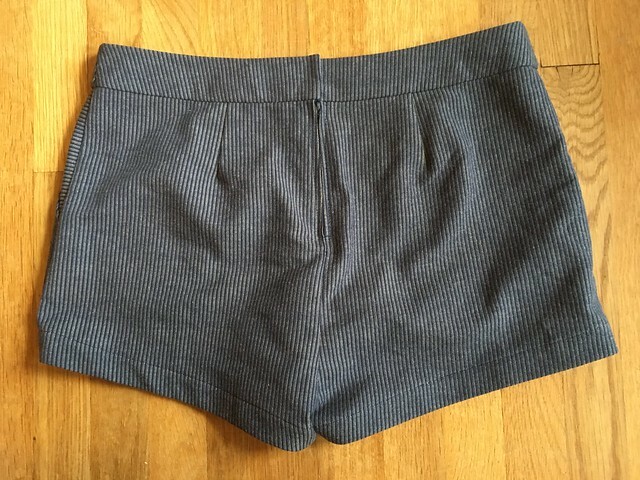 Silly as it sounds, I have been afraid of making shorts and pants because I don’t know how to fit them. But this was the year of sewing first jeans and then, this summer, shorts. I’m so glad I finally plunged in because now I have a better grasp of some of the fitting issues I might face and how to fix them. 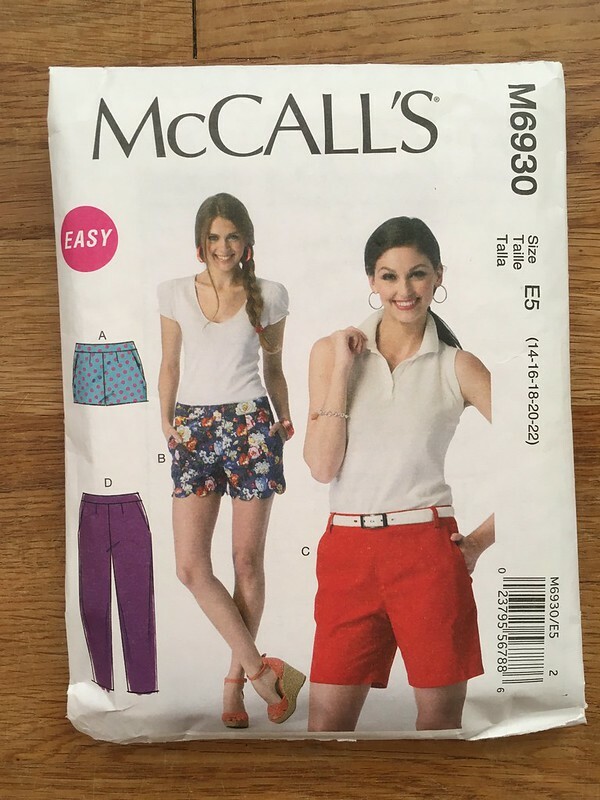 So let’s talk about this particular pattern, McCall’s 6930 (View A). There are a couple of shorts options in this one, as well as capris. They have a flat front, shaped waistband, back zipper, and pockets, with optional belt carriers. It actually took me three tries to get this right, and I took pictures of each of them, so you could see some of the things I had to fix and the mistakes I made. Last summer, I began my first version of this pattern. I could tell that something was wrong with it, but I wasn’t sure what to do, so I put it away until this summer. I nearly threw these shorts out when I was cleaning up one day, but I tried them on first and realized that they weren’t as terrible as I remembered. So, I finished them, and came up with ideas on what I wanted to improve. 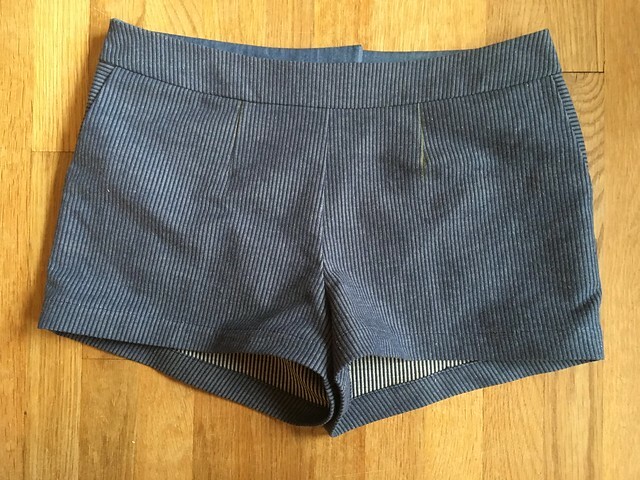 The front was baggy and went up too high, and the back felt like it needed more length in the crotch seam. The baggy front was no good. 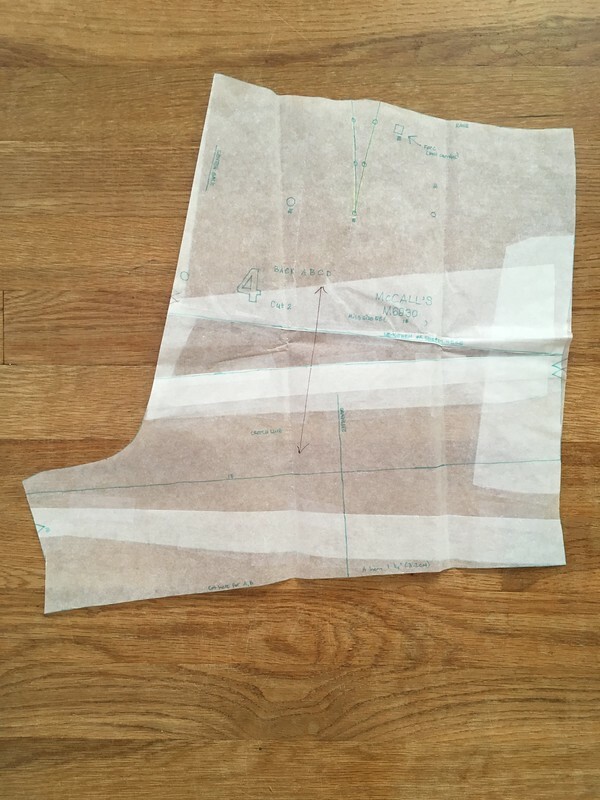 I looked in my trusty book, Sewing Pants that Fit from the Singer Sewing Reference Library, and decided to try taking a wedge out of the front and add a wedge into the back. After I had done this, I saw that the book said not to take wedges out of the front, but there was no explanation as to why, so I decided to try it anyway. I took out the wedge and redrew the top of the front crotch seam, making sure it was straight like before. When I asked a friend who used to work as a pattern drafter what was up with the book’s advice, she asked if I had redrawn the center front line and, when I told her I had, she said it ought to work. Her other suggestion was to take some of the length out of the top of the front, thereby leaving that front seam intact. 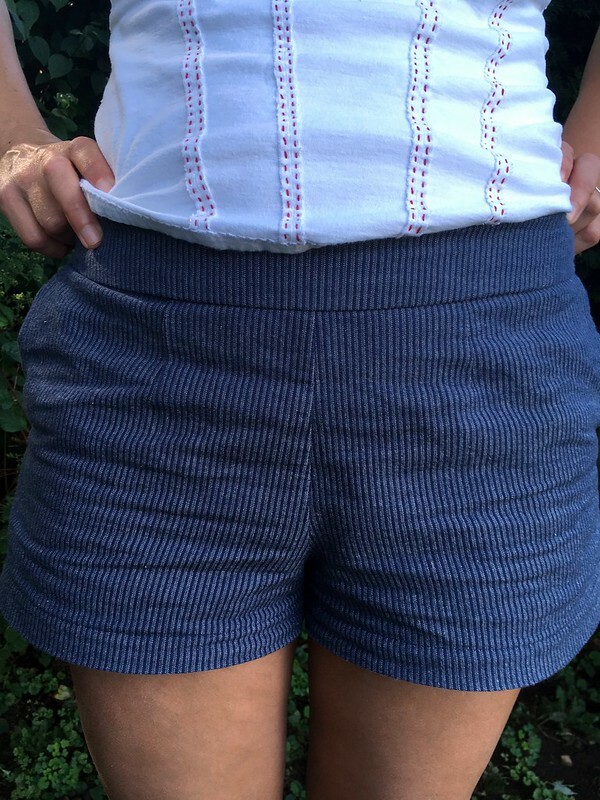 She also told me that the new grainline should be more or less perpendicular to the top of the shorts so that they would hang straight down. The front pattern piece, above. Version two came out much improved. There was one main problem, however. 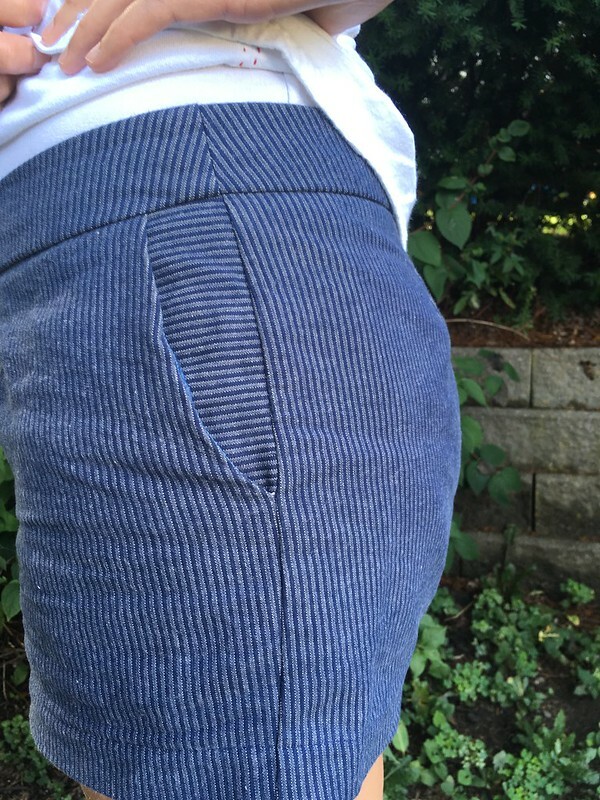 I had made these out of a stretch denim…but the pattern didn’t call for a fabric with stretch. So, as you may imagine, these shorts tend to “grow” throughout the day until they are a bit large by the end of the day. 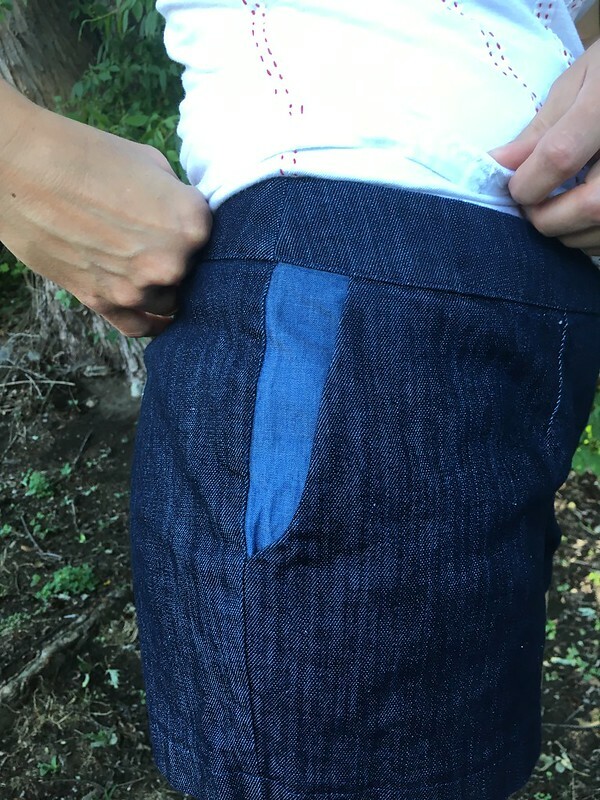 Another minor thing that I noted was that using a lighter weight fabric for the back of the pocket is not as good as using a fabric of the same weight. I did this in versions one and two. It creates wrinkles and doesn’t hang as well–not super critical, but important to note. Fabric the same weight as my denim would have worked better than the lightweight denim scrap I used. 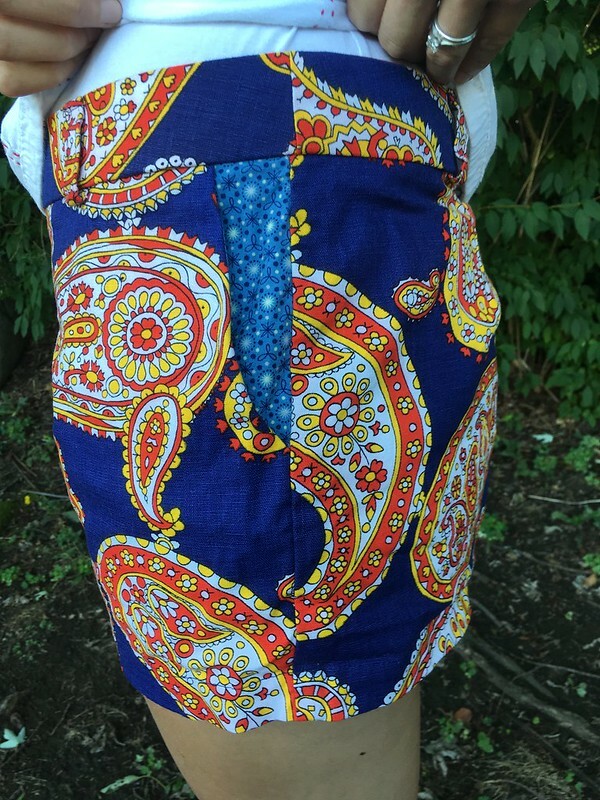 I cut into some of my precious fabric from Pintuck & Purl for my third version…and it came out great! When I put these on, they just feel right. The one thing I will probably tweak if I make this pattern again (which I’ll probably do) is to lengthen the back crotch point just a bit as the front of the legs feel closer to the body than I think they should. The leg openings aren’t too small, it’s more like they are tilted toward the back when they should be more balanced. Front view. There’s a little yellow on the darts from my chalk markings, but that washed out easily. 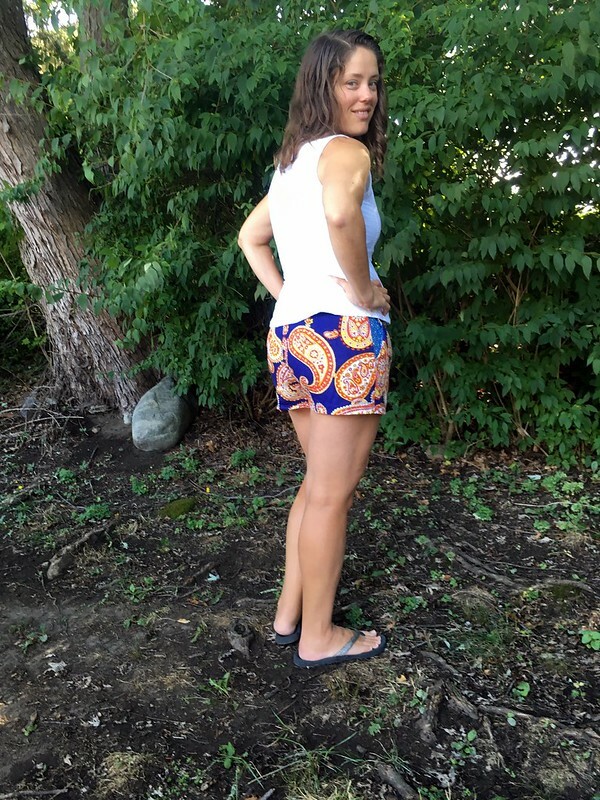 Each of the adjustments I made were the same as those I made on McCall’s 6848, the pajama-turned-everyday shorts I recently blogged about. It feels good to know I am on the right track. 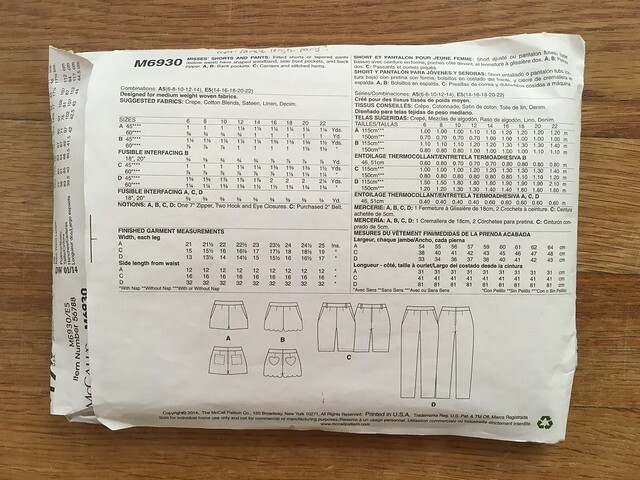 Now the question is, will these be standard adjustments for me, or will they be limited to McCall’s patterns? Either way, I feel like I’m making progress in learning to fit pants and shorts, and a lot of the scariness is dissipating. It’s such a pleasure to occasionally wear an outfit that I’ve made–not only the top, but both the top and the bottom. I’m really happy that I tried despite my fear. And…..guess what? Today is this blog’s third birthday! That’s pretty cool! I thought about doing a round-up of past posts, but I wanted to talk shorts one more time instead. I’m so thankful for this blog, which has helped me grow in confidence as a writer, seamstress, and photographer. I think I have a good groove, have seen some improvements in those areas, and I hope for more improvements in the future in both sewing and blogging. I’m also thankful for you, my readers, some of whom have been with me from the very beginning. Thank you for encouraging and supporting me in this. Learning these skills goes far beyond sewing–the confidence and happiness that comes from sewing has expanded into other areas of my life as well. So, I’m thankful for the blog, for you, and to God for the skills, time, resources, and frame of mind to grow. Thank you. And last but not least, let’s have some Recommendations! Another fun post in the Cotton + Steel substrate series is the one all about rayon, which is new to me. I’m looking forward to trying it out in the near future. 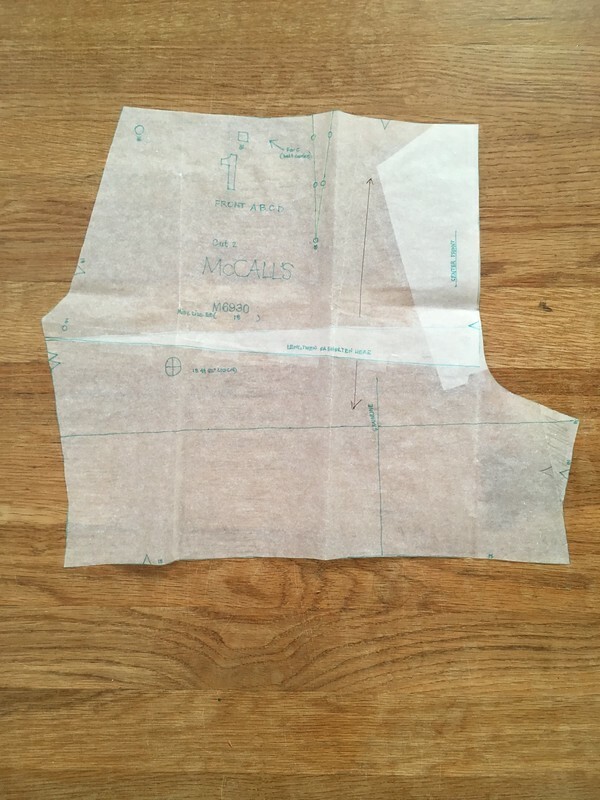 Have you ever wanted to turn your favorite button up shirt pattern into a popover top (a top with a button placket that only goes partway down the shirt)? I have! I just wasn’t looking forward to figuring it out on my own. Luckily, Craftsy did it for me. You can read all about it here. Did you know it’s National Sewing Month? It is! To celebrate, Pintuck & Purl is doing a fun Q & A with various bloggers and pattern designers over on their blog, and I’m one of the bloggers! You can read their blog here. Thank you so much for sharing this! I just got this pattern a few weeks ago and have been looking for reviews on this pattern. 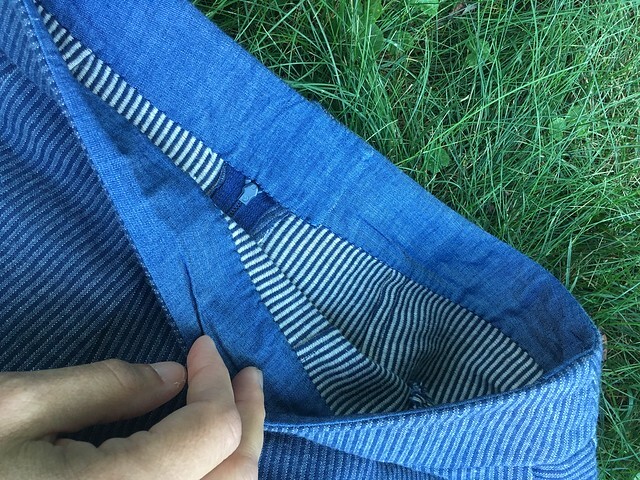 I’ve never sewed pants or shorts before – will def keep your tips and tricks in mind ! You’re welcome. I hope it helps. I think it’s a great pattern. Feel free to come back and leave a link to your blog post on them when you make them. Thank you! I dread it, too. I know what you mean. I’m so happy when I learn how to fit something, but I never look forward to it. I think, in my heart, I just love quick projects so much, but I try to mix it up between quicker and longer “learning” projects. 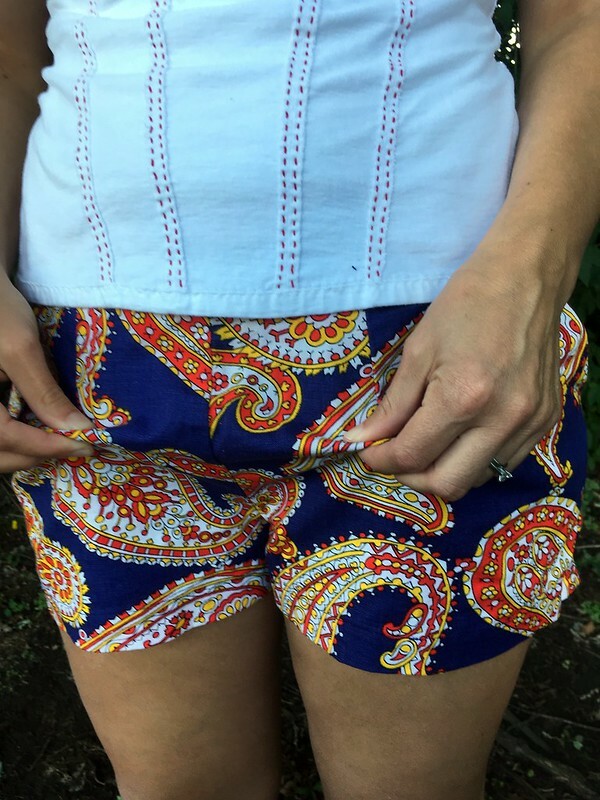 Glad to hear your getting over your fear of pants – it’s really not that much different to tops -and once you figure it out a whole new world will open up – welcome to the new world – these shorts look great!